Citation Information: J Clin Invest. 2010;120(7):2395-2405. https://doi.org/10.1172/JCI42011. Hepcidin is a peptide hormone that regulates iron homeostasis and acts as an antimicrobial peptide. It is expressed and secreted by a variety of cell types in response to iron loading and inflammation. Hepcidin mediates iron homeostasis by binding to the iron exporter ferroportin, inducing its internalization and degradation via activation of the protein kinase Jak2 and the subsequent phosphorylation of ferroportin. Here we have shown that hepcidin-activated Jak2 also phosphorylates the transcription factor Stat3, resulting in a transcriptional response. 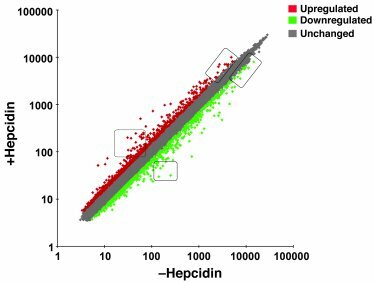 Hepcidin treatment of ferroportin-expressing mouse macrophages showed changes in mRNA expression levels of a wide variety of genes. The changes in transcript levels for half of these genes were a direct effect of hepcidin, as shown by cycloheximide insensitivity, and dependent on the presence of Stat3. Hepcidin-mediated transcriptional changes modulated LPS-induced transcription in both cultured macrophages and in vivo mouse models, as demonstrated by suppression of IL-6 and TNF-α transcript and secreted protein. Hepcidin-mediated transcription in mice also suppressed toxicity and morbidity due to single doses of LPS, poly(I:C), and turpentine, which is used to model chronic inflammatory disease. Most notably, we demonstrated that hepcidin pretreatment protected mice from a lethal dose of LPS and that hepcidin-knockout mice could be rescued from LPS toxicity by injection of hepcidin. The results of our study suggest a new function for hepcidin in modulating acute inflammatory responses. Changes in macrophage mRNA in response to hepcidin. Mouse bone marrow macrophages were incubated with FAC (10 μM Fe) for 24 hours to induce the expression of Fpn. Cells were then incubated for 4 hours in the absence or presence of hepcidin at a final concentration 1 μg/ml. Cells were solubilized, and RNA extraction was performed. mRNA levels were analyzed by Affymetrix microarray, as described in Methods. The data show the results of 2 independent experiments. A linear scatter plot of gene expression was generated, with upregulated genes labeled in red, downregulated genes in green, and unchanged genes in gray. The boxes denote genes whose transcripts were examined by RT-PCR.